A road leading to a temporary bridge over the Rakti near Garidhura was washed away as the stream overflew because of constant rains since Tuesday. The damage has snapped the direct link between Siliguri and Mirik. Vehicles coming downhill from Kurseong to Siliguri and those travelling between Mirik and Siliguri are having to take a detour through Panighata Road via Bagdogra to reach their destination. The detour is over 25km. "Due to heavy rainfall since yesterday, the approach road to the temporary bridge over the Rakti has been washed away. All vehicles are being diverted through Panighata. Officials of the state PWD have visited the site and initiated necessary work to restore the approach road," Anurag Srivastava, the district magistrate of Darjeeling, said today. The damaged stretch near Garidhura is around 15km from here. 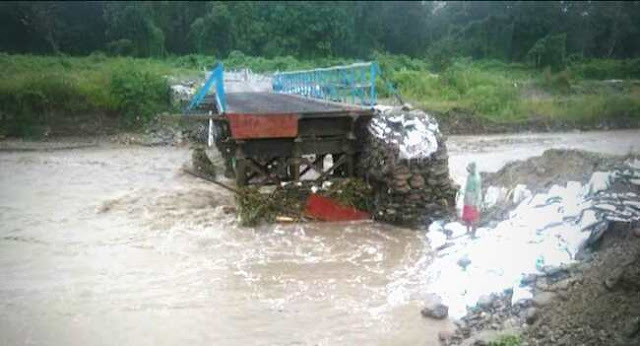 Last monsoon, a bridge on the Rakti stream had been damaged and after that, the temporary bridge was built. Today, the approach to the bridge on the Siliguri side was washed away by the swollen stream. According to Srivastava, the rainfall has led to few minor landslides in Darjeeling and Mirik . "In Siliguri subdivision, there had been waterlogging in some areas in at least six gram panchayats. Relief and rescue work is in progress," he said. The affected panchayats, administrative sources said, are Chathat, Phansidewa, Ghoshpukur, BIdhannagar-I and II and Upper Bagdogra. Because of the rains that started yesterday and continued throughout the day today in several areas across north Bengal, flight operations at Bagdogra airport have been affected. "There were 16 flights scheduled for today and three of them were cancelled due to inclement weather. The remaining 13 flights got delayed," Rakesh Sahay, the airport director of Bagdogra, said. Sources at the India Meteorological Department said it would take few more days for the weather to improve. "The southwest monsoon is vigorous over north Bengal and Sikkim. In the past 24 hours, that is, till today morning, it has rained as much as 180mm in some places. Heavy to very heavy rainfall has been reported from Darjeeling, Jalpaiguri and Alipurduar districts. It would take at least two-three days for the weather to change. For tomorrow, there is a forecast of rainfall," an official at the Met office said. As the tourist season is on, many visitors had to face inconvenience with the flight schedule getting hampered. "Many tourists are stranded," Samrat Sanyal, the executive president of Eastern Himalaya Travel and Tour Operators' Association, said. "We hope the weather will improve from tomorrow."